1 of 2 In large nonstick skillet, heat oil over medium-high heat. Add chorizo and chicken; cook for 3 minutes. Add zucchini, squash, chili powder, salt and cayenne; stir to combine. Add sour cream and reduce heat to medium; cook for 5 to 8 minutes longer or until zucchini is tender and sauce has reduced. 2 of 2 Peel and remove pit from avocado. In a bowl, mash avocado with fork. Stir in salsa and lime juice. Heat tortillas according to package directions. 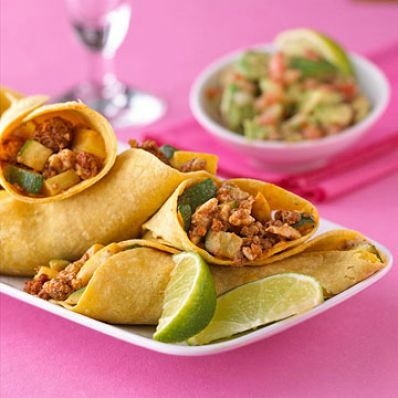 Serve chicken mixture wrapped in tortillas with avocado salsa on the side. If desired, garnish with lime wedges.